The Amulet of 49 | Robert Mitchell Jr.
Have you ever had a person in your life who drains your energy? Injects negativity? Warps, manipulates, and twists your heart and mind in torturous ways? Obviously the best answer is to stop associating with him or her. But there are some people you just can’t avoid. Like people at work, members of clubs or organizations to which you belong, relatives, and so on. I have a person like this. 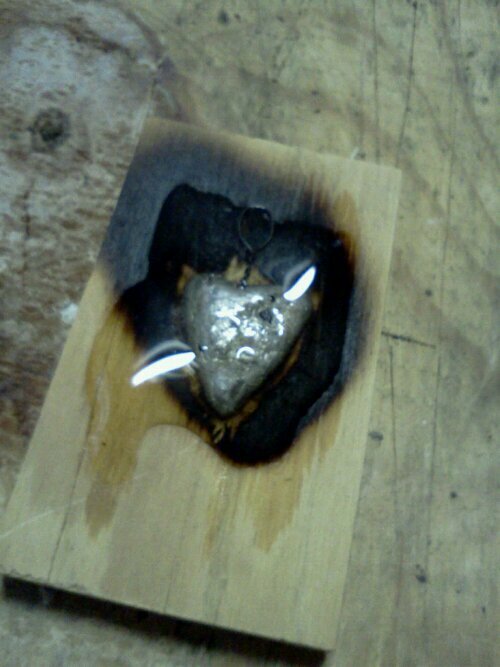 So I made an amulet to protect me. I call it the Amulet of 49. Why 49? Because 4 is the number of safety (think four walls, like a castle), and 9 is the perfect holy number (the Trinity of Trinities, 3 x 3 = 9). 7 is the lucky number, and 49 is its square. 4 + 9 = 13 which to me symbolizes the whole year (13 moon cycles) and I want this to protect me year-in and year-out. Note that, using the usual number reduction method, 13 = 4 (again, the safety number). Overall, I thought 49 did a good job of summing up what this amulet is all about. WARNING: Always wear safety goggles and beware heat and flame! Step 1. 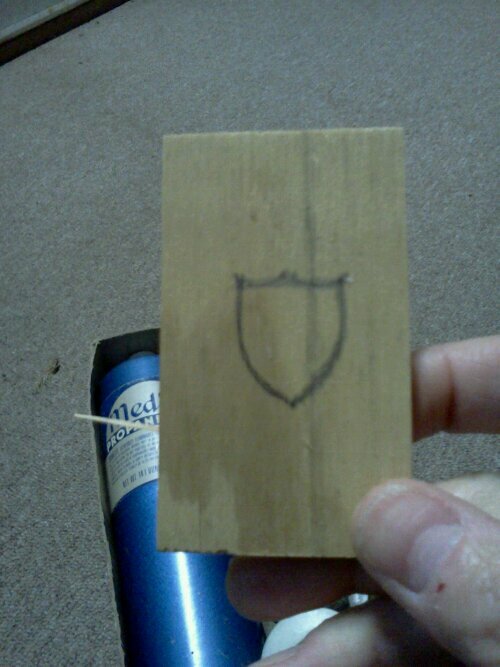 Draw the outline of a shield on scrap of wood. Step 2. Carve out the shape about 3/16″ deep. Dampen the wood so that it won’t go up like a match when the torch hits it. Step 3. Twist a bit of wire into a loop and lay it in the mold (I stripped the plastic from a twist-tie). 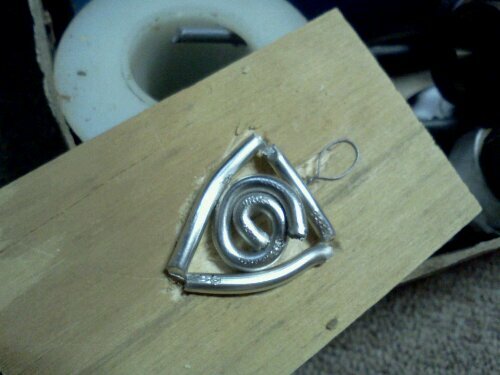 This will embed a threadable eye so you can put your amulet on a cord or chain around your neck. Step 4. 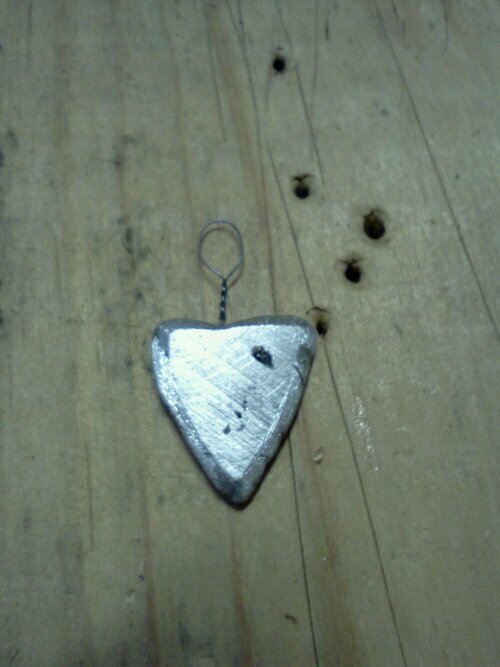 Using LEAD FREE solder, cut enough snips to roughly fill the mold. Step 5. 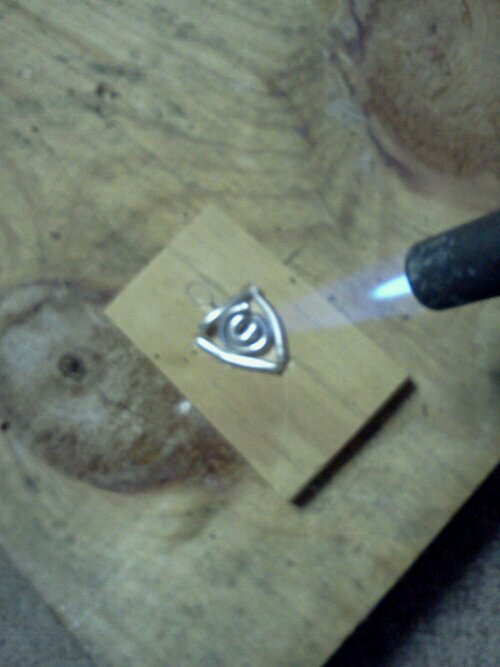 Using a torch, heat the solder until it pools. Make sure you have a cup of water nearby in case the wood catches fire. If the wood is damp it should only scorch. Step 6. Pour on a little water on to quench the metal. Allow to cool before handling. See how the wire is imbedded in the amulet? Step 7. 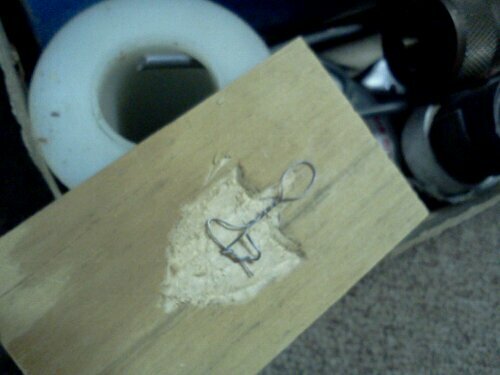 Use sandpaper to flatten, smooth, and clean up the amulet. Step 8. 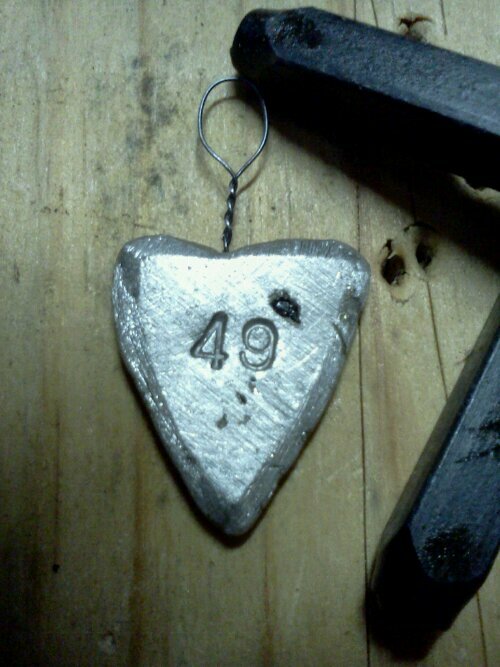 Engrave, punch, carve or write the number “49” on the amulet. I have metal punches so it was easy (you can see them on the right). There was a little black bubble in the metal. 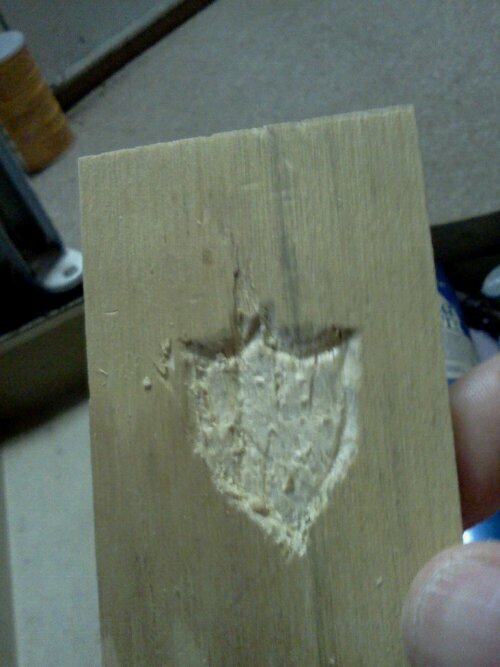 It made the shield look like a wounded heart, which is kind of what I’m trying to protect against. So I thought it was kind of cool. With the amulet constructed and ready to bless, consecrate, and charge, choose the right day (and hour if you desire) and set up your altar space. The altar space I set up for this working. I chose a Wednesday for personal reasons. Saturday would be a good day, or even a Sunday. Consult a good correspondence table and select the day you think seems most fitting. Set up three candles. White in the rear (for purity), purple on the left (for power) and blue on the right (for strength and calm). Bless and dress your candles. Some folks are really particular about this. I use Ray Buckland’s method. Get out your salt, water, oil, and of course incense. I used Frankincense because it felt right, I have plenty of it, and to me its the “when in doubt” choice that suffices for most anything. Decorate your altar. Make it powerful and attractive. 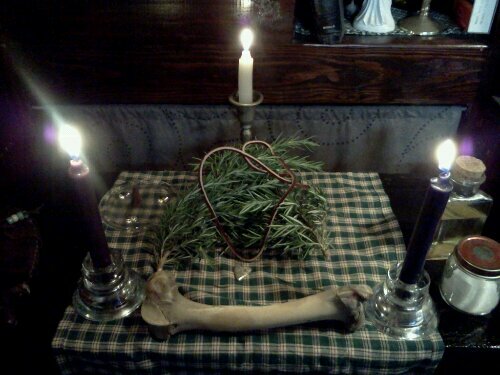 I made a nest of Rosemary to chase away evil spirits and create an air of purity. That leg bone you see in front is from a buck — a powerful symbol of strength. When you’re ready to begin, open the space with a few words to chase away any negative influences. As I light the candles I bless each direction with a call to the ruling Archangel (Uriel in the North, Michael in the East, Raphael in the South, and Gabriel in the West) and ask them to watch over the area and bless the work. Recite it over and over, keeping a regular cadence. As you do so, visualize yourself being immune to the negative effects you want to be protected from. Imagine the joy you will feel knowing that you can’t be drained, influenced, or emotionally harmed while this amulet is around your neck. Actually cry tears of joy if you are able. Keep at it until you can feel your hands growing warm, until you know it’s done. Knowing when the amulet is charged is like knowing when you’re in love. You just do. Place the amulet back in the center of the altar and let the incense burn down before removing it. Sit quietly, contemplate your work, and enjoy the moment. Make something nice to hold the amulet. I placed some of the Rosemary from the altar into a small box, then hot-glued in place a cloth liner (that’s the box you see in the picture at the top). Respect the amulet and treat it like the living protector that it is. Don’t wear it at all times. Keep it where you can easily get to it, like a purse, bag, or briefcase. Put it on before a scheduled meeting with a troublesome person and put it away when it’s over. This will have the benefit of hitting your mental switch and sending the signal to your subconscious that a change is taking place — that you will not be affected by this person. You want your brain and the amulet working as a team! I tried the amulet for the first time on Wednesday and it performed beautifully. 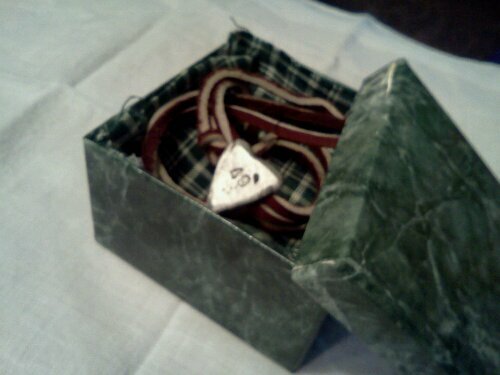 This entry was posted in Mysticism and tagged 49, amulet, charm, protection, safely. Bookmark the permalink. Great tutorial and a cool looking amulet! I need to get a torch. Thanks! Let me know if you decide to try it and I can give you a couple of tips and tweaks on the molding side of things. As to the charging part of course, there ain’t nothing you don’t already know!